DICKENS' TRAVELS IN ITALY Magic Lantern slides depicting Italian cities visited by Dickens. The Museo of PRECINEMA gives a temporary exhibition about the Italian journey during the 1844 and 1845 of the well-known English writer. The exhibition hosts a set of photographic magic lantern slides, which were manufactured at that time, they show the Italian cities visited by C. Dickens, while other slides show his most famous works. There will be also the charming Megaletoscope, a viewer made by Carlo Ponti a venetian photographer, this apparatus creates an optical illusion of depth and an impression of nighttime. The visitors will appreciate 14 albumins of Venice. In an Italian Dream from Pictures from Italy, he describes the landscapes, architecture, people and customs he observed during a year’s stay in Italy: “After a few moments, it would dissolve, like a view in a magic lantern”. During the exhibition period there will be projected a video of The Marley’s Ghost and The Chimes, it is a transposition of magic lantern slides from the originals belonging to the Minici Zotti Collection. How many of us have been grown up reading the evocative novels by Dickens? The exhibition and video projection dedicated to Dickens' travels in Italy is open for the duration of the Expo every Saturday and Sunday each week. The Museum will be closed in August. 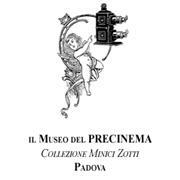 The Museum of PRECINEMA exhibits the Minici Zotti Collection, dedicated to vision before cinema. The Museum offers a journey to the origins of cinema through Magic Lantern screenings of precious hand-painted glass slides and optical illusions that create the illusion of movement. The collection also includes: an Eastern shadow theater and those of the Chat Noir in Paris, stereoscopic pictures and equipment, silhouettes and musical instruments, all of which are original items of the period. The Minici Zotti Collection presents the history of Precinema and the Magic Lantern, the antique projector of stills and "moving" images hand-painted on glass. The Department of Culture of Padova recognized the importance of the collection, collected by Laura Minici Zotti, and has dedicated a prestigious permanent exhibition to it, located in Palazzo Angeli in Prato della Valle in Padua. The Museum is a rare example of effective collaboration between the public and private sectors. In this particular space, the upper floor of the old Palazzo Angeli in Prato della Valle, there are precious magic lanterns, painted glass projection slides, optical instruments and games, musical instruments and optical views. A section is dedicated to photography and an ancient Javanese shadow theater. All items are strictly antique, whilst some have been faithfully reproduced to allow visitors to use them directly. The visit ends with a video projection illustrating the history of Precinema. Many are unaware that in 1895 the Lumière brothers created new visual possibilities with the help of cinematographic film, but few know that the Magic Lantern, invented as far back as 1650, anticipated the birth of cinema, captivating audiences with its projected images, "movement", and emotive dissolving views. Even today, Laura Minici Zotti, director of the Museum, collector and "lanternist", organizes conferences in various Italian and foreign locations. The Museum's aim is to bring the public together to appreciate this unusual, unknown aspect of vision before cinema.